Well to be honest, I was in the midst of asking around where would suit me to do a gig on my first short trip to Barcelona. And who better but the sister of one of my oldest friends (and tap-dancing partner in crime) to give me a simple answer. Get yee to Sonora de Gràcia! It’s funny, as I’ve just received a message from a fellow music collaborator who has been living here for YEARS who has never heard of La Sonora de Gràcia. So it goes to show that some places are gems that are waiting to be discovered. And some places are kept secret by those in the know, to not spoil them. I do the same with my “secret and undiscovered” islands in South-East Asia. As if me not telling anyone will stop the world descending on them and ruining them. I guess I’m mainly thinking about the Lonely Planet’s and Rough Guides of the world. Anyway, back to the theatrical tavern and musical instrument-friendly boudoir that I started to tell you about. It’s hidden away in Gràcia. Now, I’m still only a few months into my official status as Barcelona resident (as in I’ve got through the crazy game of obtaining empadronamiento), so I’m not completely au fait with the precise borders of Gràcia, but I feel confident that if it’s in the name of the venue, it must fall within Gràcia territory. So, having made Facebook contact with the “friend” conversing on behalf of Sonora de Gràcia, I got myself on the mailing list for interested performers, and was soon receiving invitations in Catalan for the Sunday Night Jam Session. Having now been at a fair few Barcelona Jam Sessions, I can tell you that this one is like no other. The sheer variety and originality of instruments that appeared on the stage – a guy even played a table at one point. I had walked in with my favourite guitar of the moment, my nylon-stringed “Classica”, and was made to feel so welcome, I felt immediately part of the furniture (including the afore-mentioned table). After having being given a rather tasty vino tinto to settle the “arriving solo at my first jam session in a new country” symptoms, I was asked when I would prefer to play and introduced to the vast, eclectic and smiling orchestra before me. The night ensued with just about every genre being covered, fused and intertwined with friendly banter, dance and merriment. When I finished my mini-set, I was asked when I would do my first full night in the space, and so I write now to say: ladies and gentleman, that time is now. I invite you all this musical place of magic, where I shall be sweeping you away into fairy tales. Indeed, after I first sang at La Sonora de Gràcia, and new to the Barcelona music scene, I asked members of the public to describe my genre of music… “Fairytale Music” was the response. And wonderfully enough, this description has now become very much part of me and my music. So La Sonora de Gràcia, I thank you. La Sonora de Gràcia is a musical cocktail bar and small theatre on Riera de Sant Miquel in Gràcia which opened in 2013. 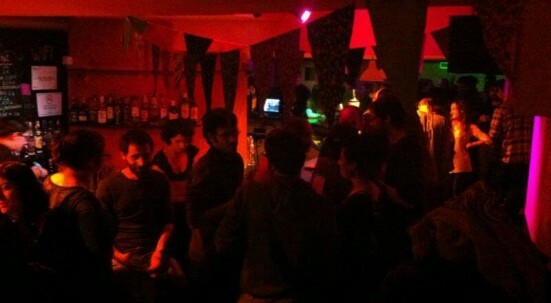 They have live music and DJ sessions of soul, funk, latin, rock, pop and world music. You can find them on Facebook and Twitter. 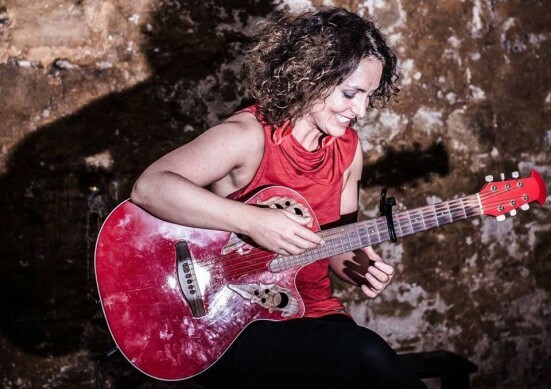 Catch Camilla’s unique fairytale music, with a repertoire of entertaining folk, moving chanson and loop-tastic popera at La Sonora de Gràcia on 17th February at 9.30pm. Having recently moved to Barcelona from London, Camilla Mathias will immerse you in an enchanting and entertaining journey. Folk meets French pop, chanson meets cabaret, fused with electronic looping, classical guitar picking and multilingual storytelling.